Krank Up Your Advertising with a Vehicle Wraps in Dallas TX! Let us design, print and install a vehicle wrap on your company vehicle. That’s right, you can turn your car, truck or van into a moving billboard that provides top-notch advertising for your business every where it goes all day, every day. We are Kranken Signs Vehicle Wraps in Dallas! We have over twenty years of experience in designing, printing and installing advertising vehicle and car wraps. Kranken Signs Vehicle Wraps in Dallas is one of America’s leaders in vehicle wraps for all vehicle types and styles. We are one of the most experienced professionals you will find. Whether you need a single car wrap or full fleet. Graphic vehicle wraps requires skill and experience to do effectively. You can trust us as your experts in vehicle wraps, and we are proud of our top-quality work. No surprises, just the best vehicle wraps in Dallas, TX market today. We know that your success and the most effective and proper exposure of your brand may never come easy. Let us help you extend your branding strategy with a Vehicle Wrap Advertising campaign. Our unique custom-crafted designs will be very specific to your company and brand and then broadcast your message ALL OVER Dallas, TX. The highways, byways and roadways are populated with many thousands of vehicles, called traffic counts. Your message will be seen all day long. Many businesses are making deliveries, customers visits, service calls, business meetings and so much more. If your business has a vehicle it’s well worth the additional expense to advertise while you work. Did you know that for the cost of a cup of coffee a day, the number of times your vehicle wraps in Dallas will be seen make this the single most effective advertising you can buy. More people in more locations will identify with your business, your contact information and your brand. Our Vehicle Wraps are Done RIGHT! When you ensure that every vehicle in your fleet is wrapped or lettered and your message and brand is in view, the return on your investment can be far and away the best advertising investment you can make! 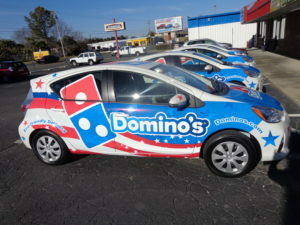 Let us help you ensure that your unique, custom-designed vehicle wrap will turn your vehicles into effective, brightly colored advertising on wheels. Our professional graphic designers are experienced artists and our designs are above the fray when you compare us to other vehicle wrap advertising providers. We have developed our own “the science of vehicle wrap advertising” and we will make it advertising work for you! Contact us today. Call us today for a free consultation and learn more about how we can turn your car, truck, van, box truck or entire fleet into effective mobile advertising. Vehicle Wraps Advertising in Dallas Are Effective. We offer complete vehicle wrap advertising packages: with top grade professional design, fast and efficient state-of-the-art wide format digital full color printing, and we offer certified installation in your area. Plus we offer the only written one-year warranty offered anywhere is the US. The cost of a vehicle wrap will vary due to different sizes and complexities of body parts and auto body contours. Custom vinyl vehicle advertising wraps range in price from $1500-$5000. Logo Design, Branding and Unique one-of-a-kind mascots and cartoon characters. A vehicle wrap in the Dallas Fort Worth area can generate over 50,000 advertising views every day. How soon do you want to get started? Call us today 972-559-4975. Kranken Signs Vehicle Wraps is a Legitimate Car Wrap Advertising Company with locations in over 10 major US markets. Copyright © 2019 dallas tx vehicle wraps. All rights reserved.